A Pakistani-born Florida man repeatedly posted detailed bomb-making instructions and messages of support online for would-be ISIS attackers, according to the FBI. Tayyab Tahir Ismail, 33, is accused of posting the illegal orders on at least five occasions between July and September. 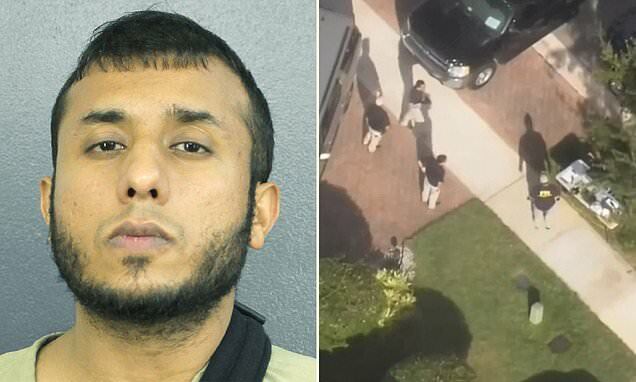 The FBI say Ismail, of Pembroke Pines also did searches on how to build bombs and included step-by-step instructions on building a suicide vest. One message Ismail is accused of sharing online read: 'You are surrounded by methods to hit them. Kill the devil's soldiers without hesitation. Make them bleed even in their own homes. He also once lived with James Medina, who is serving a 25-year prison sentence for plotting to blow up a South Florida synagogue and Jewish school, according to the affidavit. Ismail, a naturalized U.S. citizen from Pakistan, shared a home with Medina in 2016 while he planned an attack.